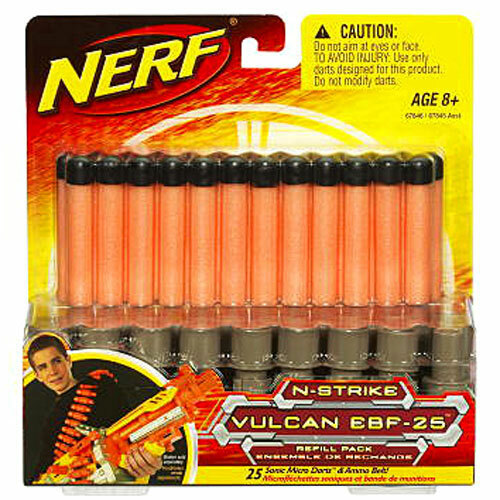 "Keep your NERF blaster (sold separately) fully loaded with this refill pack of 25 SONIC MICRO DARTS ammo that whistle as they fly! Reload right away to get back into battle faster with the spare ammo belt, or use the belt as dart storage to speed up the reload of any dart blaster. " Refill pack of 25 SONIC MICRO DARTS ammo that whistle as they fly! Includes an ammo belt for keeping darts close at hand! Darts work with most NERF blasters. Ammo belt for use with N-Strike VULCAN EBF-25 blaster (sold separately).